We tried on a selection of sizes and found the length to be about right, so we suggest you choose the size you normally wear in men’s street shoes. The footbed width is “medium” or D/E width. We did find the instep area to be snug. If you have an average or lower instep, these should work OK, but if you have a high instep, they’ll likely be too tight in that area. The Stomper by Black Brand is a classic lace-up lug sole style which will appeal to cruiser riders. The build quality is very good and they have a D3O upgraded insole and protection in all the appropriate places. I like the overall construction and material used in this boot. The sole is plenty thick and sturdy, the heel and toe areas are very firm and the interior is nicely padded and finished out in a durable breathable material. I also like the lace setup. Its pretty standard, but when you untie the laces, the mouth of the boot can be quickly opened wide as the laces slip easily through the metal eyelets (without having to manually tease the laces loose). 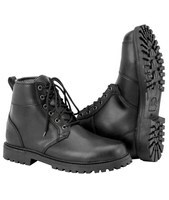 This boot is equipped with a Hipora liner between the boot’s leather and the interior lining. The waterproof liner will keep your feet dry in a rain. But with a short boot like this, you’ll need to make sure your pants or rainsuit pants have a way to secure over the tops of this boot way down low to keep water from entering over the top. Black Brand says: The Stomper lace up work boot is the perfect all-day boot, strong enough for kick-starting yet still comfortable for walking thanks to the D30® insole. And, with their rugged construction, they’ll last long enough for you to love them.